This vintage outfit could be used as pajamas or out on the town. 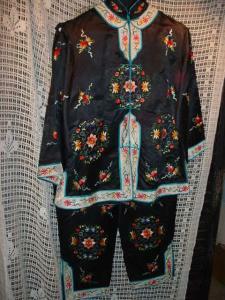 Beautiful Oriental Black silky pants and jacket embroidered with multi-colors. Pants have 2 left side snaps. Both legs have a 4 inch slit at the bottom. Embroided flowers decorate both the front and back of legs with a white strip of embroided flowers at hem-line. Waist is about 32 inches, legs measure 38 inches from waist to bottom hem. The black jacket has embroided flowers on back and front, some in circular pattern. Same white strips of embroidery accent the collar and hem-line. Bust 38 inches, length 25 inches and sleeves 23 inches from neck to cuff hem. This is for a small sized person. Condition is terrific as it looks it was not worn much if at all. Very elegant.